I've been wearing Invisalign since last November. I wasn't sure if I would talk about it on the blog, but here I am. My teeth were always something I felt self-conscious about, and I finally decided to pamper myself and take the plunge. Most of my friends couldn't understand why I even got "adult braces", but it was purely for ME. This week I put in my last set of trays and I'm excited to almost be done. Sure it was a bit of an investment, but it was something I always wanted. So... hooray for little celebrations, and for every-once-in-a-while doing something for YOU. This might be just the motivation I need to do this- my teeth have shifted in the 15 years since I had my braces removed and I keep putting off Invisalign, thinking next year will be better timing (isn't it always next year?). But the best time to do something for yourself is now! Ahh thats amazing! I can't believe how quick you got done with yours! I started mine back in September and I'm currently on my 17th of 54! It seems like I'll be wearing them forever. I absolutely love Invisalign - noone at work can tell and lately I've been getting so many compliments on how amazing my teeth are starting to look (from the people that know haha). I know everyone is different. I ended up only having 15 sets, so it went by really fast. Good luck on your journey! That's awesome! Congratulations on almost being done! I've had Invisalign for almost 4 years now and still have over a year to go. It was originally only supposed to be 2 years, but I've had to do 2 refinements and each of those is a year and a half long. It's a hard decision to get braces as an adult, but it's totally worth it! I agree-- it was totally worth it for me! Congratulations! I have Invisalign too, and I can't wait to be done. It is amazing how great it feels to have straighter teeth. I guess it depends on how many sets you end up getting, but when I first got them, they hurt A LOT. Like, the first week my teeth felt like they were going to fall out of my mouth when I took my trays out. As the process has gone on, when I change every two-ish weeks my teeth feel a little tight, but they don't hurt anymore. My husband had braces and said the same as you about them-- they were painful! Congratulations Katie!! I'm actually a little jealous, i've been dreaming to get some Invisalign braces for 3 years now but they are so expensive! :( Glad you're happy with them dear, can't wait to get mine! Fingers crossed! You're right- they are quite the investment. I've been wanting them for years, but finally was in a position to make it happen. It was still tough for me dropping that much money on my smile! Congrats! A friend is also on her Invisaling treatment and is very happy of how quick her teeth have moved to their position, they (her sister is a dentist) told me that teeth are in constant movement so although it may seem that adults don't need to wear braces anymore it's in fact the opposite, because with age they have been moving a lot from the original position. Or something similar, I'm not an expert! :) Yay for your me time! So true-- Hope is definitely going to need braces in the next couple of years, so I was happy we were able to do it right now! Good for you. I got my braces off a month ago and I am 58! i have secretly always wanted braces. so happy for you and for taking care of what you want! you have a pretty smile no matter what. WooHooo! That is so awesome! I am glad you took the time/investment to pamper yourself! Looking forward to all of the smiles! Invisiline is on my to-buy list for when I have my car paid off in October. My top teeth are mostly straight, and so are my bottom, but they don't align together at all. Only my back two molars touch, which is bad for your teeth. I'm so lucky we have these discreet options vs traditional braces! 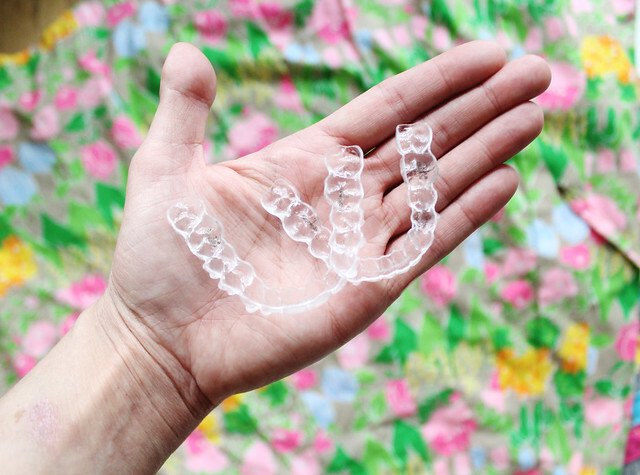 Invisalign are great because you never have to let anyone know you are fixing your teeth; you can just do it! I did invisalign at 31 and loved it! My family could never afford braces and I was also self-conscious of especially my bottom teeth. A year later it was done and my colleagues never knew. I spoke at conferences without issue. I still wear them at night to keep the correct. Happy that you did it for yourself and like the results. I get my Invisalign trays in FOUR DAYS. I'm so nervous about it, but I've been so self-conscious about my teeth that I can't wait to get the process started. Thanks so much for sharing.